Good oral health care includes professional dental treatments provided by your dentist and good habits at home. You should eat well-balanced meals and limit between-meal snacks. Keep your teeth clean by brushing and flossing. Healthy habits ensure healthy teeth and gums by preventing tooth decay and gum disease. Your gums, periodontal ligaments, and underlying bones support your teeth and hold them in place. It is important to keep both this foundation and your teeth healthy. Your mouth contains bacteria. Some of the bacteria are good, and some types can be harmful to your teeth. Bacteria contained in plaque are a major cause of tooth decay and gum disease. Plaque is a thin sticky film that constantly forms over your teeth. The sugar or starch in foods fuels plaque. The sugars mix with the bacteria in plaque to form destructive toxins. Plaque helps to hold the toxins in place against your teeth. Plaque plays a major role in tooth decay. Plaque that has hardened on your teeth is called tarter. 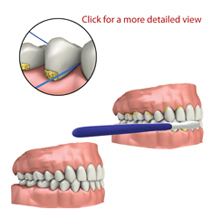 Tartar provides plaque with an ideal growing space. Plaque and tartar build up can lead to gum disease. Plaque is constantly forming on your teeth. It may cause your teeth to not “feel clean.” Additionally, pieces of food may stick to your teeth or get caught in between your teeth when you eat. Your dentist can recommend an oral heath care plan for you at your dental examination. Your dentist will examine your teeth and gums. Your dentist can prescribe mouth rinses and fluoride treatments if you need additional care. Home treatment involves regular brushing and flossing. You should brush your teeth twice daily. Floss your teeth once a day. You should follow the specific instructions provided by your dentist. Brush your teeth with a toothpaste containing fluoride. Your dentist may recommend special types of toothpaste for you. In some cases, dentists prescribe prescription toothpaste containing larger amounts of fluoride or plaque fighting ingredients. Your dentist can recommend the type of toothbrush that is most appropriate for you. Toothbrushes come in a variety of sizes and bristle types. To begin brushing your teeth, hold your toothbrush at a 45° angle and place it against your gums. Gently move the toothbrush in circular strokes. Brush all sides of your teeth’s surfaces. Use up and down strokes to brush the front of your teeth. In addition to brushing your teeth, make sure you brush the soft surfaces in your mouth including your gums and tongue. There are a variety of dental flosses to choose from. Your dentist can recommend the most appropriate one for you. To floss your teeth, first break off about 18 inches of dental floss and wrap the ends of the floss around the middle fingers on both of your hands. Use your thumbs and index fingers to maneuver the floss in your mouth. Place the floss gently between your teeth. Gently move the floss in the space between your tooth and gum. Move the floss against the side of your tooth while moving it away from your gum. You should floss between each of your teeth and the back side of your last tooth. Good oral health helps to ensure healthy teeth and a lasting smile. Practice good habits at home. Make and keep all of your dental appointments.